A diving legend meets the God of the Sea! 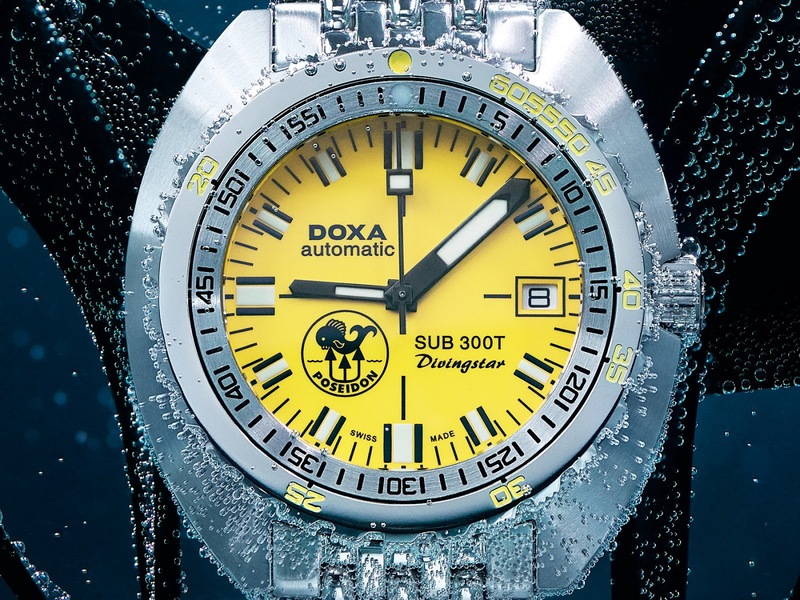 This stunner is the new SUB 300T Divingstar Poseidon Edition a recreation of a rare 1970s DOXA. 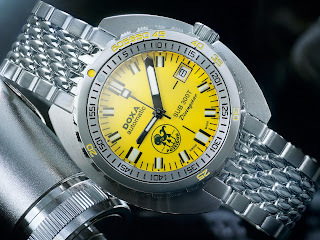 Once again DOXA Watches has tapped into another [BLACKLUNG] historic partnership with one more super Special Edition SUB in a different classic DOXA color – this time, a recreation of a rare 1970s-era dive watch, which was also created in partnership with the Swedish SCUBA gear manufacturer, Poseidon. 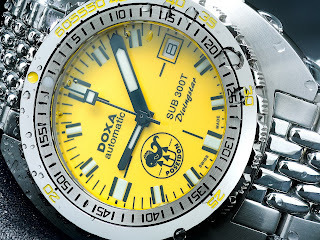 DOXA are best known for their iconic orange-dialed diver’s watches such as their the classic SUB 300T Professional – which is also available with black Sharkhunter or silver Searamble dials, but besides these they also produced a lesser known, bright yellow Divingstar dial. Such was the rarity of the yellow Divingstar dial that it became one of the most highly sought after DOXAs for vintage dive watch collectors. 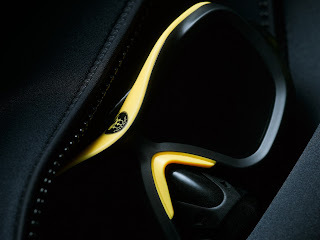 However there was an even rarer version of the SUB 300T Divingstar that created in partnership with the Swedish SCUBA gear manufacturer, Poseidon. 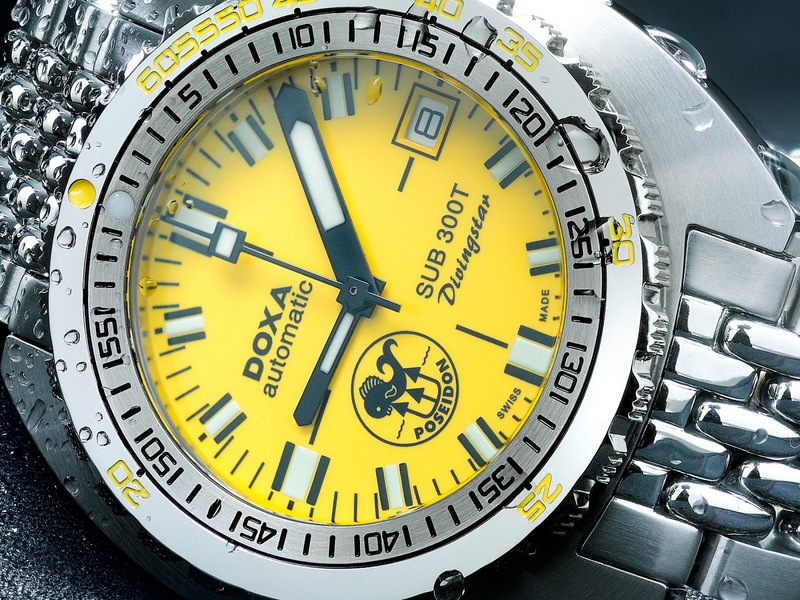 The watch had all the standard features of other DOXA dive watches but with the addition of a black and yellow Poseidon logo to the lower left quadrant of the yellow dial. 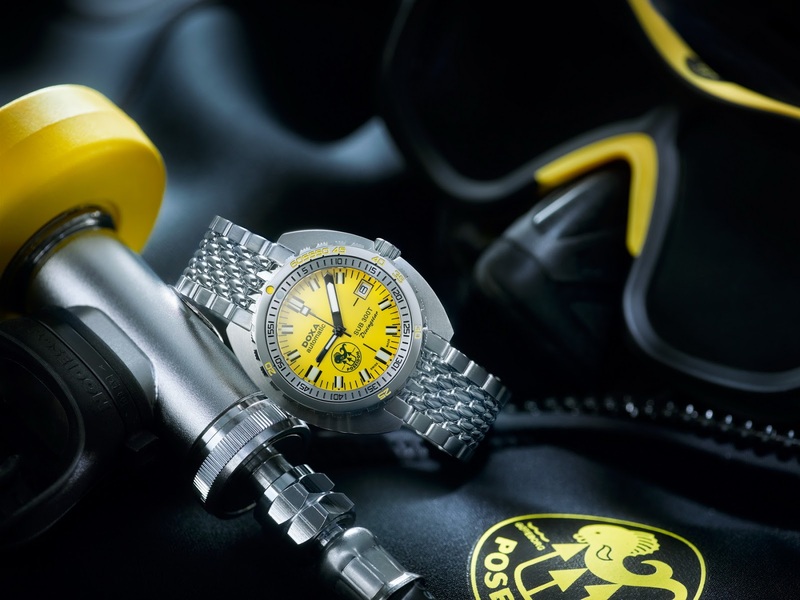 It was the perfect collaboration, as both brands were on the cutting edge of dive gear development – while aesthetically the shared use of the colors, yellow and black allowed for a seamless execution of the Poseidon logo on the Divingstar dial. The 1970s were considered the SCUBA diving heydays with better, safer and more reliable equipment becoming available, the increased accessibility of jet travel and of course it was a time when we started (not me, I was only a tiny nipper) to see some really special divers watches being produced. 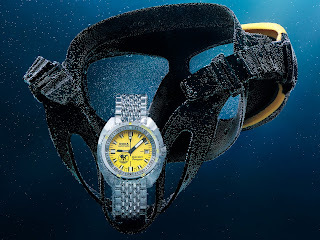 In those days (more so than today) dive watches were considered a vital piece of your dive gear, as critical to safety as a depth gauge or breathing regulator. And one of the must have dive watches was a DOXA — purpose-built, rugged, and trusted to keep track of time underwater. 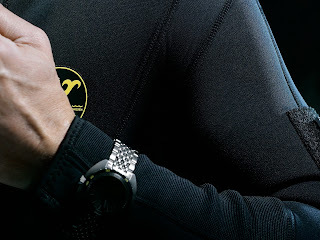 The God Father of diving himself wore DOXA. So did SEALAB divers and the French Navy. Nuff said! 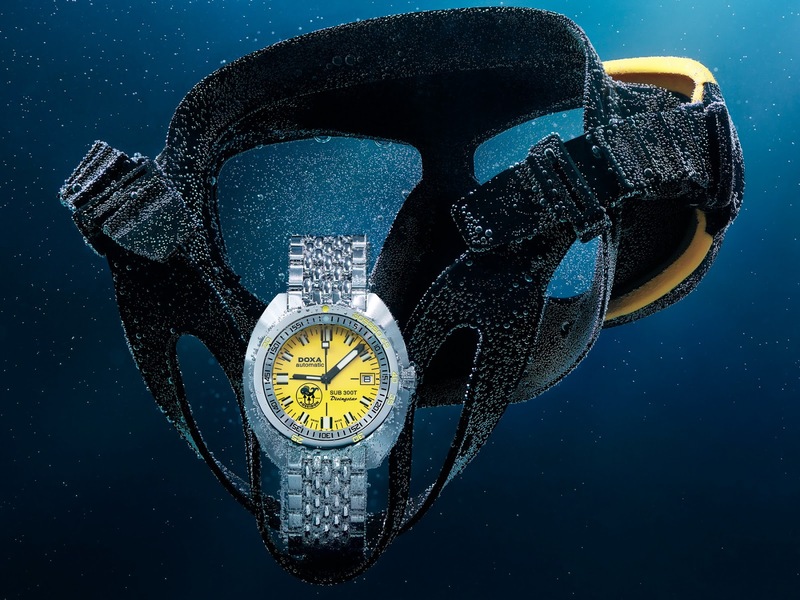 Despite dive watches becoming more fashion orientated during the 1970s, DOXA’s designs remained close to its diving roots, with its signature oversized minute hand, bright legible dials and patented bezel, printed with the US Navy’s No-Decompression Limits scale. 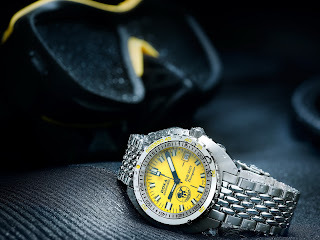 "The Poseidon SUB watches are amongst our most requested pieces by collectors from our catalog spanning fifty years,” says Rick Marei, General Manager of the SUB division at DOXA Watches Ltd.
With the DOXA SUB 300T Divingstar Poseidon Edition, these two great diving names are once again joined on the dial of a watch that symbolizes rugged innovation and under water adventure. The watch resembles its 1970s forefather but has been updated for today with some modern features. The crystal is now highly scratch-resistant Sapphire. The automatic movement inside is the well-proven Swiss ETA 2824-2. And the watch is now water-resistant to 1200 meters, four times the depth rating of the original SUB 300T. Dial markings and hands are coated with layers of SuperLumiNova for optimum long-lasting legibility in dark and murky conditions. The steel bracelet fitted to this special watch is DOXA’s iconic beads of rice style, with solid end links and a fold-over clasp with an extension for use over a thick diving suit. The SUB 300T Divingstar Poseidon Edition features a helium escape valve on the left case flank, which allows trapped Helium inside the watch to evacuate during decompression in a diving bell. 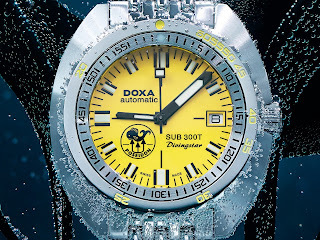 DOXA pioneered the Helium Escape Valve in the late 1960s, when it was used extensively by commercial and military divers living for extended periods in underwater habitats, and was the first brand to offer it publicly on a watch.